Our Tents are made with the highest Quality 10.38 oz Sunforger Canvas. The canvas is natural colored and 100% cotton. The strong but lightweight canvas is marine boatshrunk, water repellent and mildew, mold, algea, and fungi resistant. They should give you many, many years of service. Our tents feature double stitched seams and reinforcements at the corners and grommets and webbing stake loops along the bottom edges. Optional Double Door, Sod Cloth, Ground Cover and Tent Flys are available. We use Industry Standard 36 inch panels on all of our tents. A Sod Cloth is band of canvas about 10 inches -12 inches wide that is sewn around the bottom, inside of the tent, not including the door. The purpose is to create a 'seal' to the ground to block wind, etc. from entering the tent at the ground level. The Sod Cloth is used instead of straw. Note that the Sod Cloth is not a tent floor, you will need a Ground Cloth to serve that purpose. A Double Door tent has both a front door and a back door. The primary purpose of the back door is increased ventilation. All of our "A" Frame and Wall Tents are available with the optional Double Door. A Ground Cloth provides a floor for your tent and helps keep everything clean and dry. 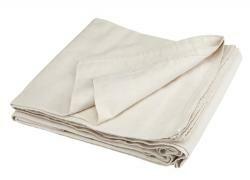 Placing a Ground Cloth over the tent Sod Cloth will seal the bottom edges of your tent from wind, debris, and moisture. The Tent Fly can be mounted at the front of the tent so as to double as shelter space or it can be mounted directly over the tent to protect it from UV rays and adding another moisture barrier layer. The Tent Fly helps keep the tent roof clean and helps keep tree pitch and tar off the tent roof. The Tent Fly overhangs the tent side walls and takes water and snow away from your tent side walls. We can Custom make any size tent larger, smaller, and/or taller. Please call us 208-398-7279 for a price quote. Flame Retardant Tents are available upon request and at an additional charge. Please call us 208-398-7279 for a price quote. The cleaner you keep you canvas tents, flys, and ground cloths, the longer they will last. Mildew grows on dirt, so it is important to clean your canvas before putting it away. To clean our canvas we recommend mild hand dishwashing liquid like Ivory in lukewarm water; about a capful to one gallon. Lay the canvas flat and scrub GENTLY with a rag or a very soft brush. The harder you scrub the more you risk scrubbing off the waterproofing. DO NOT use bleach or any other chemicals. When finished make sure you rinse very well. Any soap left on the canvas could cause the tent to leak. Make sure the canvas is VERY DRY BEFORE you store it. We do not sell tent poles. The shipping cost would be prohibitive and you can purchase them at your local home improvement store. Our Tents are proudly MADE IN USA. Additional Shipping charges may be applied due to box size, weight, and shipping distance. This A Frame Tent is 6 feet Deep, 8.5 feet Wide, and 6 feet High at the ridge. The tent is made of 10.38 oz. Sunforger treated Marine Boatshrunk Canvas. This tent has sewn in loops for ground stakes. This tent requires 7 Tent Stakes. The tent comes standard with a Single Door, but a Double Door is an option. Sod Cloth, Ground Cloth and Tent Fly are also available for this size tent. The A Frame or Wedge Tent was used during the Revolutionary War thru Civil War times. This A Frame Tent is 9 feet Deep, 8.5 feet Wide, and 6 feet High at the ridge. The tent is made of 10.38 oz. Sunforger treated Marine Boatshrunk Canvas. This tent has sewn in loops for ground stakes. This tent requires 7 Tent Stakes. This A Frame Tent is 9 feet Deep, 8.5 feet Wide, and 7 feet High at the ridge. The tent is made of 10.38 oz. Sunforger treated Marine Boatshrunk Canvas. This tent has sewn in loops for ground stakes. This tent requires 7 Tent Stakes. The Sergeant Wall Tent is a smaller version of the Officer Wall Tent and is 9' long, 8'6" wide, and 6' high with 36 inch sidewalls. 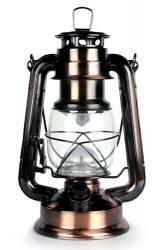 The Wall Tent is made of 10.38 oz. Sunforger treated Marine Boatshrunk Canvas. The Wall Tent features double stitched seams with reinforcements at the corners and grommets. The tent walls feature a cord reinforcement for stability. The ridge is vented and there are brass grommets at each end of the peak and brass grommets along each side at the top of the wall. This tent has sewn in loops for ground stakes. The Wall Tent comes standard with a Single Door, but a Double Door is an option. Sod Cloth, Ground Cloth and Tent Fly are also available for this size tent. 11" Steel Tent Stakes are recommended for the ropes on this Wall Tent. The Single Door Wall Tent uses 9 Tent Stakes: 4 on each side for the sidewalls and 1 at the back wall. The Double Door Wall Tent uses 8 Tent Stakes: 4 on each side for the sidewalls. Tent Slips for every rope on the tent are needed to keep the canvas taut. This tent uses 8 Tent Slips. 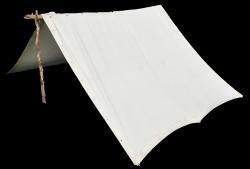 The Sergeant Wall Tent is a smaller version of the Officer Wall Tent and is 9' long, 8'6" wide, and 6' high with 24 inch sidewalls. 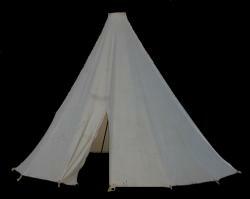 The Officer Wall Tent is 12' long, 10' wide, and 7' high with 42 inch sidewalls. 11" Steel Tent Stakes are recommended for the ropes on this Wall Tent. The Single Door Wall Tent uses 12 Tent Stakes: 5 on each side for the sidewalls and 2 at the back wall. The Double Door Wall Tent uses 10 Tent Stakes: 5 on each side for the sidewalls. Tent Slips for every rope on the tent are needed to keep the canvas taut. This tent uses 10 Tent Slips. The massive Hospital Wall Tent is 14'6" long, 14' wide, and 11' high with 54 inch sidewalls. The Wall Tent comes standard with a Single Door, but a Double Door is an option. A Sod Cloth is also available for this size tent. For a tent this size, an 18" Steel Tent Stake should be used with the ropes at each of the 4 corners. This tent uses (4) 18" Steel Tent Stakes. The Single Door Wall Tent uses (12) 11" Tent Stakes: 4 on each side for the sidewalls and 4 at the back wall. The Double Door Wall Tent uses (8) 11" Tent Stakes: 4 on each side for the sidewalls. Tent Slips for every rope on the tent are needed to keep the canvas taut. This tent uses 12 Tent Slips. The Tent Fly can be set up AT THE FRONT of the tent so as to double as shelter space. The Tent Fly can be set up DIRECTLY OVER the tent to protect it from UV rays and adding another moisture barrier layer. The Tent Fly helps keep the tent roof clean and helps keep tree pitch and tar off the tent roof. The Tent Fly overhangs the tent side walls and takes water and snow away from your tent side walls. The 12' x 12' Tent Fly fits over all of our A Frame Tents, our Sergeant 36" Wall Tent, our Sergeant 24" Wall Tent, and our Officer Wall Tent. Our Tent Fly is made of 10.38 oz. Sunforger treated Marine Boatshrunk Canvas. It features double stitched seams with reinforcements at the corners and grommets. There are brass grommets along each side and in the middle of each end. 11" Steel Tent Stakes are recommended for this fly. This fly uses 10 Tent Stakes. Tent Slips for every rope on the fly are recommended to keep the canvas taut. This fly uses 10 Tent Slips. The 12' Wide x 15' Long Tent Fly fits over our Sergeant 36" Wall Tent, our Sergeant 24" Wall Tent, and our Officer Wall Tent. 11" Steel Tent Stakes are recommended for this fly. This fly uses 12 Tent Stakes. Tent Slips for every rope on the fly are recommended to keep the canvas taut. This fly uses 12 Tent Slips. The M1864 Shelter Tent is made from 2 Shelter Halves that button along the top to form a wedge shaped tent. Our shelter halves are made of quality 10 oz cotton canvas and are complete with buttons and corresponding holes to receive the other half. Each shelter half is alike; there are not "rights' and 'lefts'. The M1864 Shelter Tent is made from 2 Shelter Halves that button along the top to form a wedge shaped tent. Our shelter half is made of quality 10 oz cotton canvas and are complete with buttons and corresponding holes to receive the other half. Each shelter half is alike; there are not "rights' and 'lefts'. The picture shows the completed shelter tent. Click on the picture for more images. The M1864 end closure is a triangular shape to enclose the end of a M1864 shelter tent. It is made of the same quality 10 oz canvas and the M1864 Shelter Half and easily buttons on the the shelter tent. The picture shows the installed end closure on a shelter tent. Click on the picture for more images. This A Frame Tent is 6 feet Deep, 8.5 feet Wide, and 7 feet High at the ridge. The tent is made of 10.38 oz. Sunforger treated Marine Boatshrunk Canvas. This tent has sewn in loops for ground stakes. This tent requires 7 Tent Stakes. This A Frame Tent is 7 feet Deep, 8.5 feet Wide, and 7 feet High at the ridge. The tent is made of 10.38 oz. Sunforger treated Marine Boatshrunk Canvas. This tent has sewn in loops for ground stakes. This tent requires 9 Tent Stakes. This A Frame Tent is 7 feet Deep, 8.5 feet Wide, and 6 feet High at the ridge. The tent is made of 10.38 oz. Sunforger treated Marine Boatshrunk Canvas. This tent has sewn in loops for ground stakes. This tent requires 9 Tent Stakes. The Sibley Tent was invented by the American military officer Henry Hopkins Sibley and patented in 1856. The conical shaped 2/3 Scale Sibley Tent is 8' High and 12' in Diameter. It is held up by a single pole in the center. 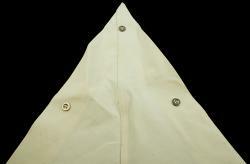 The peak of the tent has a sewn in iron ring collar and brass grommets. The tent is made of 10.38 oz. Sunforger treated Marine Boatshrunk Canvas. The base of the tent is secured with reinforced brass grommets. 11" Steel Tent Stakes are recommended for this tent. This Tent uses 17 Tent Stakes. The conical shaped Scale Sibley Tent is 12' High and 18' in Diameter and sleeps 10 - 12. It is held up by a single pole in the center. The peak of the tent has a sewn in iron ring collar and brass grommets. The tent is made of 10.38 oz. Sunforger treated Marine Boatshrunk Canvas. The base of the tent is secured with reinforced brass grommets. 18" Steel Tent Stakes are recommended for this tent. This Tent uses 23 Tent Stakes. The 15' Wide x 15' Long Tent Fly fits over our Hospital Wall Tent. 11" Steel Tent Stakes are recommended for this 15' Wide x 18' Long Tent Fly. This fly uses 14 Tent Stakes. Tent Slips for every rope on the fly are recommended to keep the canvas taut. This fly uses 14 Tent Slips. 11" Steel Tent Stakes are recommended for this 15' Wide x 21' Long Tent Fly. This fly uses 16 Tent Stakes. Tent Slips for every rope on the fly are recommended to keep the canvas taut. This fly uses 16 Tent Slips. The Ground Cloth provides a floor for your tent and helps keep everything clean and dry. Placing a ground cloth over the tent Sod Cloth will seal the bottom edges of your tent from wind, debris and moisture. The 6 foot x 8 foot Ground Cloth fits our 6 foot Deep x 6 foot High A Frame Tent and our 6 foot Deep x 7 foot High A Frame Tent. Our tent Ground Cloth is made of is made of 10.38 oz. Sunforger treated Marine Boatshrunk Canvas and features double stitched seams. The Ground Cloth provides a floor for your tent and helps keep everything clean and dry. Placing a ground cloth over the tent Sod Cloth will seal the bottom edges of your tent from wind, debris and moisture. The 7 foot x 8 foot Ground Cloth fits our 7 foot Deep x 6 foot High A Frame Tent and our 7 foot Deep x 7 foot High A Frame Tent. The Ground Cloth provides a floor for your tent and helps keep everything clean and dry. Placing a ground cloth over the tent Sod Cloth will seal the bottom edges of your tent from wind, debris and moisture. The 9 foot x 8 foot Ground Cloth fits our 9 foot Deep x 6 foot High A Frame Tent, our 9 foot Deep x 7 foot High A Frame Tent, and our Sergeant 36" Wall Tent and our Sergeant 24" Wall Tent. The Ground Cloth provides a floor for your tent and helps keep everything clean and dry. Placing a ground cloth over the tent Sod Cloth will seal the bottom edges of your tent from wind, debris and moisture. The 10 foot x 12 foot Ground Cloth fits our Officer Wall Tent. Hand forged tent stakes are made of 3/8" Black Squared Steel Stock, approximately 11" long. Hand forged tent stakes are made of 3/8" Black Squared Steel Stock, approximately 18" long. The 18" steel tent stake is a must for securing the corners of our large wall tents. Order 4 per wall tent. Tent slips keep the tent ropes tight and the tents sturdy. The peanut-shaped piece of wood is threaded into the tent ropes, then angled and pulled tight. The peanut shaped tent slip measures approximately 5.5" long, 1.75" wide, and 1" thick. Stained with Linseed Oil. Available in Pine or Poplar wood. 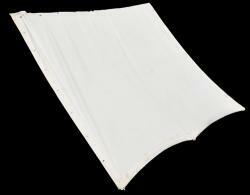 Per military specs "Tent slips - To be made of cherry, birch, or other close-grained and suitable wood. For wall tents, 5 1/2" long, 1 3/4" wide at each end, 1" in diameter in the middle, and 1" thick throughout, a hole at each end, 3/8" in diameter, to receive the tent cord." 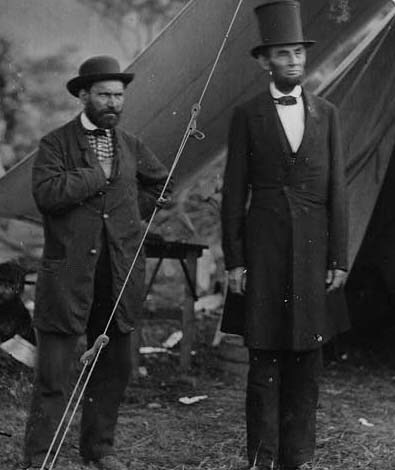 NOTE the Tent Slip in the Photo Above: President Lincoln meets with Detective Alan Pinkerton at Antietam Battlefield October 1862. Click on the picture of the tent slip to see a larger image. The rectangular tent slip measures approximately 5.5" long, 2" wide, and 1" thick. Stained with Linseed Oil. Available in Pine or Poplar wood. While the peanut-shaped tent slips were to military specification, rectangular tent slips were easily crafted in the field and were thus readily available. Few foot soldiers would have carried around the extra weight of steel tent pegs. Steel was more important for other uses than tent pegs so it is likely that even officers may have used wooden tent pegs. Discarded crates, tree branches and small trees were very common and it was easier to make the tent pegs when needed rather than carry them on a 20 mile march. This camp-made Tent Peg would have been made by the soldier from a discarded crate. The head of the peg is about 1.5 inches and the length about 9.5 inches. There are notches on both sides about 1.5 inches from the top. To make the the peg easier to drive into the ground you can cut angled points on the tip. And after a few uses, the peg will look wonderfully worn and authentic. The tent peg is made from poplar, not pine, for durability and longevity. Few foot soldiers would have carried around the extra weight of steel tent pegs. Steel was more important for other uses than tent pegs so it is likely that even officers may have used wooden tent pegs. This round tent peg is the typical issued tent peg that was mass produced. The head of the peg is about 3/4" and the length about 9.5". The tent peg is made from oak, not pine, for durability and longevity. We have been in the wool clothing business since 1976 manufacturing all types of wool coats, wool jackets, wool vests, wool pants, cotton shirts, and more. We ship all over the world. We can custom make wool & cotton garments for you as well. Much of our clothing proudly MADE IN THE USA in the State of IDAHO.